Over the years we have replicated buildings from all over the world, and in no particular order. Many times this leaves us with a few buildings from a major city, but an incomplete miniature skyline. 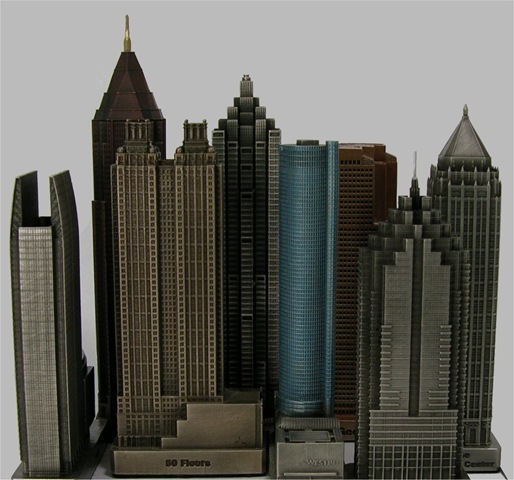 Looking back on the replicas we’ve done, I found that Atlanta needed to be better represented in the souvenir-building department. 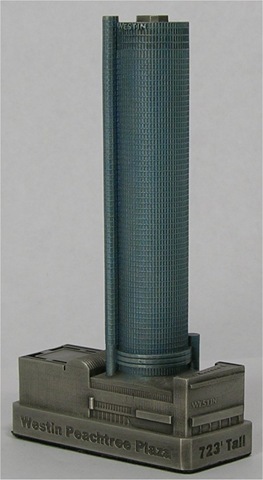 After the new additions, there are currently 8 of the top 10 tallest skyscrapers represented in pewter. Each model is scaled in 1 inch = 150 feet. This is currently the tallest building in Atlanta standing at 1,023 feet tall with 55 floors. BOA Plaza was completed in 1992 in postmodern architectural style and is also the tallest skyscraper in the southern US. 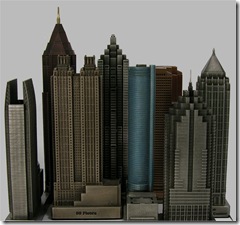 One Peachtree or SunTrust Plaza is the second tallest building in Atlanta and stands 871 feet tall with 60 floors. Third tallest skyscraper in Atlanta but was once the tallest from 1987 to 1992. One Atlantic or IBM Tower stands 820 feet with 50 floors. This tower is the fourth tallest in Atlanta standing 770 feet with 50 floors. Johnson/Burgee Architects designed 191 Peachtree as well as One Atlantic Center. The Westin was Atlanta’s tallest from 1976 until the completion of One Atlantic Center in 1987. This Plaza is currently the fifth tallest coming in at 723 feet with 73 floors. Georgia-Pacific is the sixth tallest building but was the second tallest from 1982 until 1987. 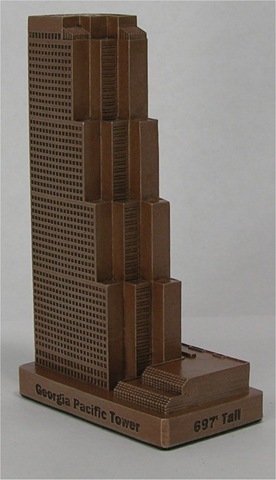 This tower stands at 697 feet tall with 52 floors. Standing at 691 feet tall, the Promenade II is the seventh tallest skyscraper in Atlanta. Two other buildings in similar design to Promenade II were proposed to be built at the same time but never were. Rounding out the top ten tallest skyscrapers in Atlanta is 1180 Peachtree. This unique tower stands 657 feet tall with 41 floors and was completed in 2006.